These metallic colors are archival, sustainable and nontoxic. 11:20 Crafty Scribe: after experimenting with a special blend of pigments and micas, I test each color. Here are my ink doodles for each color that act as initial swatches. The ink is studiocrafted and made with the metallic pigment, gum arabic and distilled water. 11:31 Crafty Scribe: the larger swatches help me better see the vibrancy and sheen / sparkliness of each color. 09:12 Crafty Scribe: During the weekly open air market where I have a booth, I often get inquiries about what I do as an artist. Today's blog is dedicated to giving you highlights about Crafty Scribe the artist. My vendor's booth often focuses mainly on Scribe's Ink: ink/paint making kits, studiocrafted paints, handmade papers and other scribal materials and tools. I sometimes have time to talk about, as a writer (my main art), that I wanted to create calligraphic copies of my poems and short stories (and have some out as examples) that would be archival, using pigments and ingredients that have stood the test of time and that were also non-toxic. Photography is another art of mine. My art focuses more in other areas. Crafty Scribe is an extension or spin-off of A Wandering Mind. What is A Wandering Mind? Simplified answer is a manuscript in the making. I have published 23 installments of the main story online to date ( wanderingmind.space/intro/ ). Originally, the installments were published on Medium: www.medium.com/@virtuonaut In fact. this is where Parts 14 - 23 are ( not yet on wanderingmind.space ) I began wanderingmind.space about two years ago to create a one-stop shop for all my creative endeavors. It's a passion project in process. I try to carve away at this niche little by little when I have time. When a mind slips into creative mode, filters fall away. It makes a leap to venture Beyond. From there it wanders, releasing thought droplets that are drawn together by an imaginative, fluid current. As the mind surrenders itself to InnerSight, it begins to project a passage, flowing from private abstraction to public sensation. -"Beyond"
There is an art to designing the space in which that art resides. 09:44 Crafty Scribe: From ancient hieroglyphs to digital avatars: creativity nowadays does not just involve tactile paintings by artists. These very same artists also need to design how their art appears digitally. In real estate there is a common saying: location, location, location. In the digital world it is: presentation, presentation, presentation. We all know those websites that drive us a bit mad: bad design. It's not just "getting the product/art out there" on my vendor's booth table... As any artist/vendor knows, there's a lot going on behind the scenes. Today that means you also need to have a mirroring of what you do in physical space on the digital plane. "I am just starting out, but eventually, that is my goal." Right now, my main art is providing others the tools to make their own art... my way of fostering creativity. I hesitate to explain too much, since I want people to appreciate the photograph by itself or the poem by itself and have each individual have their unique take-aways. The photograph I selected to accompany "Sinisthereal" has significance. It is a black and white filtered image of a roll of film. Trickster is a character in A Wandering Mind and is a public figure. Whereas Scribe is a writer (and educator) Trickster's art is more media and film-related. I talk more about "Indirectly Direct" in this previous Crafty Scribe post ( LINK ). It is about the color PURPLE, the second pigment I experimented with. For those of you familiar with Crafty Scribe's offerings, I offer scrolls of handmade paper and also screenfoldable (and screenfolded) authentic Mayan hu'un paper. 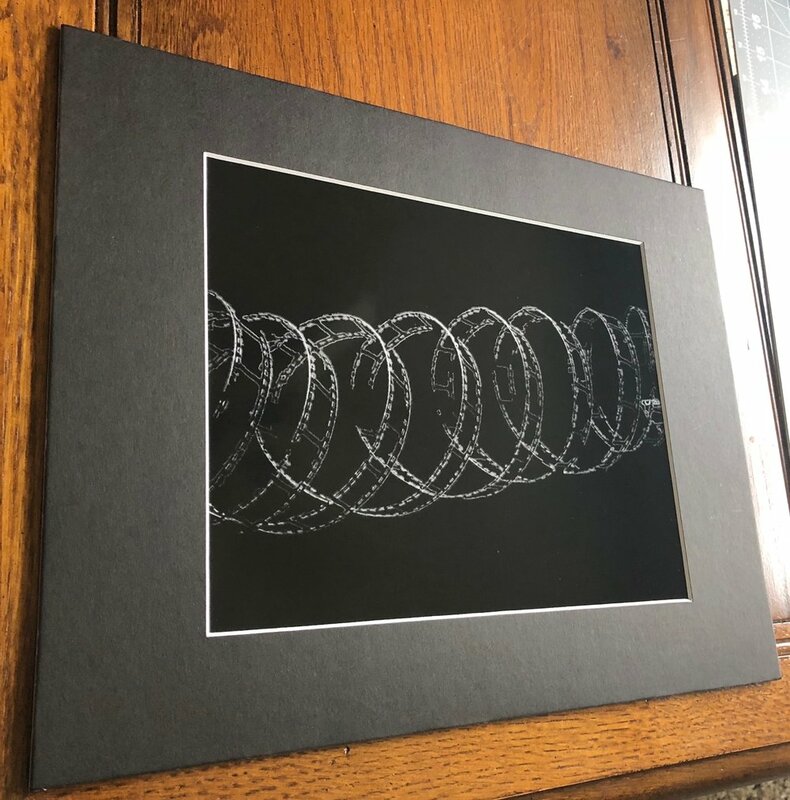 10:31 Crafty Scribe: I'll be putting out my calligraphically (poetically) signed photographs at my next appearance(s) at the open air market booth, weather permitting. I hope to be at the Labor Day festivities from 12pm-6pm Saturday September 1st in Canal Winchester, OH (on Waterloo Street near downtown). Another art of mine: trying to predict the weather - as an open air market vendor, very important ;-) So far, only a 40% chance of rain. 09:15 Crafty Scribe: this coming Saturday’s featured collection at my open air market booth (weather permitting...) will be my medieval set. As we move on from the ancient colors (Egyptian & Mayan color sets - pictured in the tray as watercolor rounds), colors become more vibrant due to more manmade color experiments (and accidental color discoveries due to these experiments). I absolutely love the violet (manmade, mineral-based). It reminds me of Tyrian purple (a very expensive natural pigment). All the sparkly micas are part of the medieval set due to my focus on illuminated manuscripts as examples for using the medieval colors. I also currently offer another dye-based pigment: woad (in my medieval collection), which is very similar to indigo. I have yet to experiment with fabric dying (i.e. tie dying) with my dye-based pigments, but when I do, I will share the recipe I used. If you plan to experiment with dying fabrics and threads, use the dye-based pigments. For now, there are many recipes and tutorials available online and on YouTube. 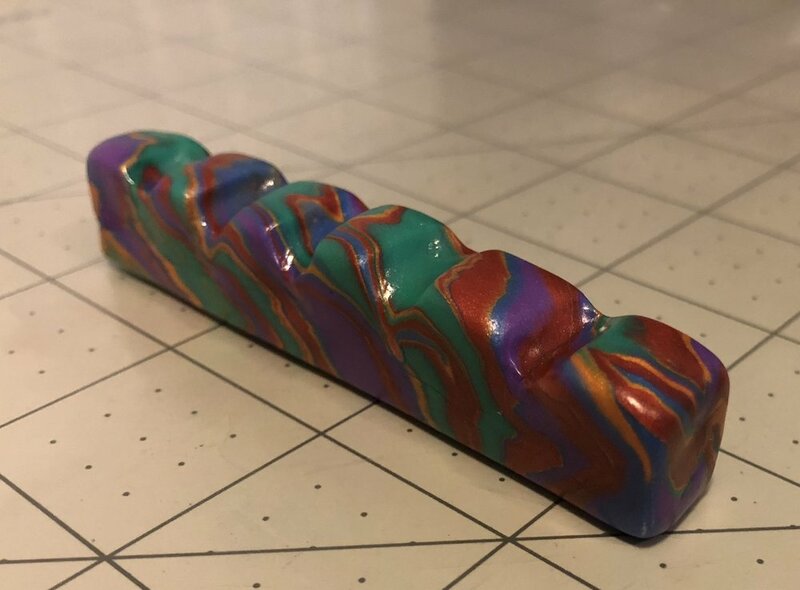 I love seeing what my customers come up with on their own, too, when they share with me their stories about how they used the pigments. 13:43 Crafty Scribe: In addition to a custom-designed writer/artist travel desk that's in my workshop (still in the prototype phase), here is another of my Carve a Niche projects. I did a hands-on project as I was doing research for "Leaves" in A Wandering Mind (I'm also a writer in addition to Crafty Scribe's product line & workshops). In A Wandering Mind, the character Scribe records telepathic messages for historical record. There have been innumerable scribes throughout history that recorded important events. The past, present and future are all connected. How we do things today - including language - is based on the foundation of thousands of years worth of history and cultural practices. One of these historical waypoints for the character Scribe is Nordic culture. The header image today is what I call the runic round (based on historical records). 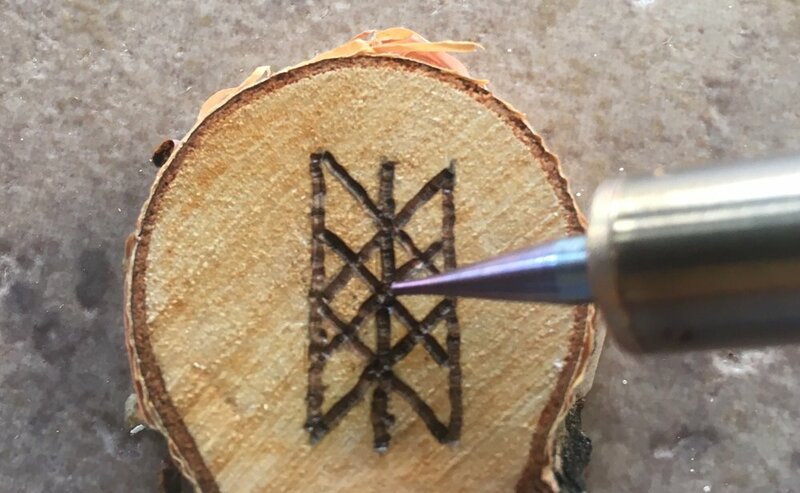 In addition to a set of individual runes woodburned onto small birch pieces, I burned all 24 runes onto one larger birch cross section. It was my way to see the entire runic set at a glance. There are runic pairings that have symbolic significance to the Nordic world vision. Although these runes are displayed in 2-D (in a horizontal line on the birch round), you have to think more in 3-D to understand how all the runes are related. Imagine spheres of rings that can circle each other and spin in space. 13:58 Crafty Scribe: I chat a bit about my woodburning and woodworking background in this video (I have several relatives who I grew up with that were very crafty...). Some of the topics I talk about in this six minute video are how craftiness fuels creativity and involves important design aspects. I chat about my family's woodworking hobbies, runes, poetry, short stories and (online) education (my background: for eighteen years I worked in higher education as a foreign language educator and administrator working on technology enhanced projects, hybrid/blended courses, designed fully online classes, and created a professional learning network for foreign language educators ). An author's commentary about the importance of do it yourself (DIY) and hands-on activities with creative work and designing virtual spaces. Short stories mentioned in video: "Lily" & "Dune"
14:38 Crafty Scribe: In addition to my online endeavors, I am at a local open air market every Saturday. I love meeting all the first-time and frequent open air market people and hearing about their stories and interests - not just related to arts and crafts. This summer so far I have had a few inquiries about offering workshops. As I tell those I meet at the open air market, I am just starting out, but workshops are part of my (long-term) plan. Please feel free to contact me via e-mail [ craftyscribe@icloud.com ] or direct message me on social media about any workshops where you'd like me to present [ (Social Media Direct Message - click on one of the social media icons in the footer of the webpage, follow me on one/all of those social media platforms & use their DM tool to send me a message ]. 11:34 Crafty Scribe: here’s a behind-the-scenes glimpse at what a small-scale creative endeavor like Crafty Scribe is like. I talk about some recent interesting conversations, measuring & my regular CONCEPTualization to continually improve Crafty Scribe’s offerings. what will the designs convey? 08:47 Crafty Scribe: each year for the past four years I have more or less stuck to a routine of creating some part of a project a day. Whether it was selecting one photograph to share [ visit instagram.com/virtuonaut ], writing a story or a poem day [ wanderingmind.space ], and now, crocheting a colored strand, it helps build something that alone may not amount to much, but when brought together and spun into something else turns into more of a work of art. Today I'll share one piece of a larger project - Fine Threads. Each woven design is one of a kind. 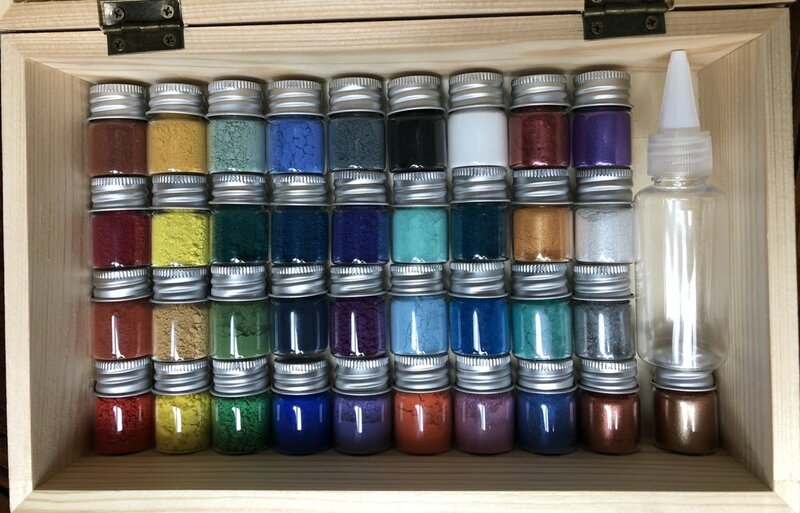 The threads I use mirror the pigment colors I’ve curated. I'll share more about my Fine threads projects here in my workshop soon. 07:38 Crafty Scribe: Before the open air market yesterday, I prepared a few opaque watercolors (gouache) for the kids' craft corner that I organize each Saturday as part of my vendor's booth. Yesterday's theme was designing a greeting card (today is Father's Day...) What's nice about watercolors is that you can prepare them, they can dry - and like off-the-shelf / retail watercolors, you just add water to the brush and paint away. I store them in these nice little one-teaspoon squares which have lids. My customers can choose their own (color) adventure based on which colors in my curated collection they want. The kids each Saturday (whether it's ink, acrylic, watercolor or oil paint) get to choose their own color and I mix up their color on the spot. It creates a learning opportunity for children and adults alike to see how inks/paints are made from scratch. However, it saves time to mix some paints/colors ahead of time. Back to the opaque watercolor (gouache) recipe that I used. Now, this is just a guideline. 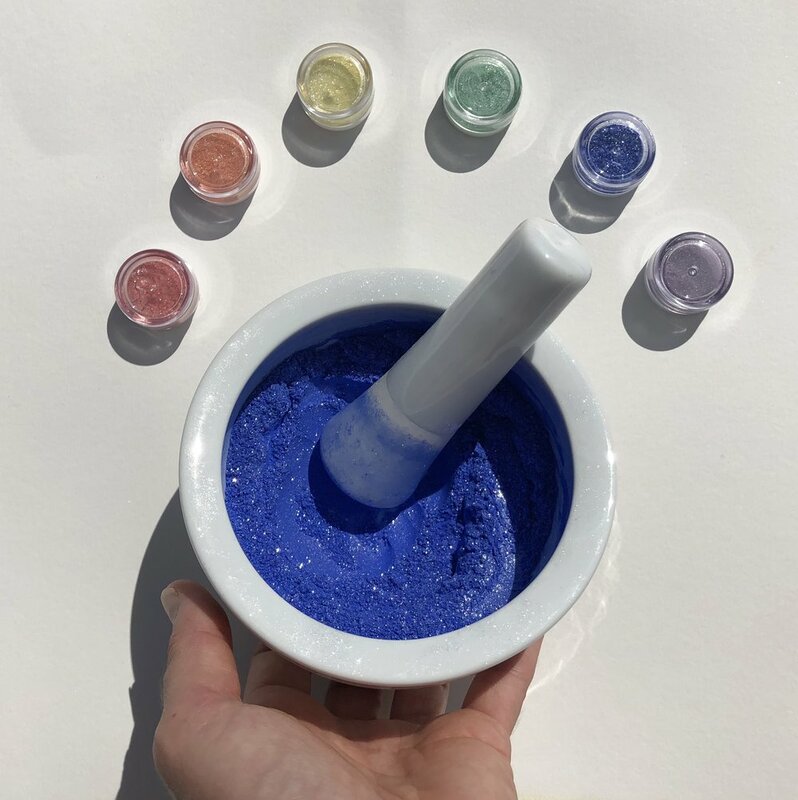 Based on the unique characteristics of each dry pigment, you may need to add a bit more or less of the dry pigment. Upon mixing, you will know. MAKES: approx. four watercolor squares. STEP 7: you can immediately use the wet paint or let dry for a few days. If you prefer to use later, the dry watercolor will keep for a very long time if kept in a dry, airtight, clean environment. 04:31 Crafty Scribe: Early rise this AM (old dog care...) - This coming weekend at the open air market my Kids’ Craft Corner will be creating pet rocks. It’ll be a teaching moment, too (I’m an educator at heart). The pigments used to make the ancient cave paintings and petroglyphs are in my curated color collection. Both the earth red in the Egyptian kit and the hematite orangish-red (in main medieval kit & extended Mayan kits) have been used for millennia. I am creating signage for my booth space - re-usable chalk boards. For the kids’ craft corner this weekend, I will have on display some of the first signs, thanks to this book The First Signs. You can see a copy of them on my record sheet from last year when I was trying out an earth-based red. To make colors pop on the black chalkboard I will use chalk paint. 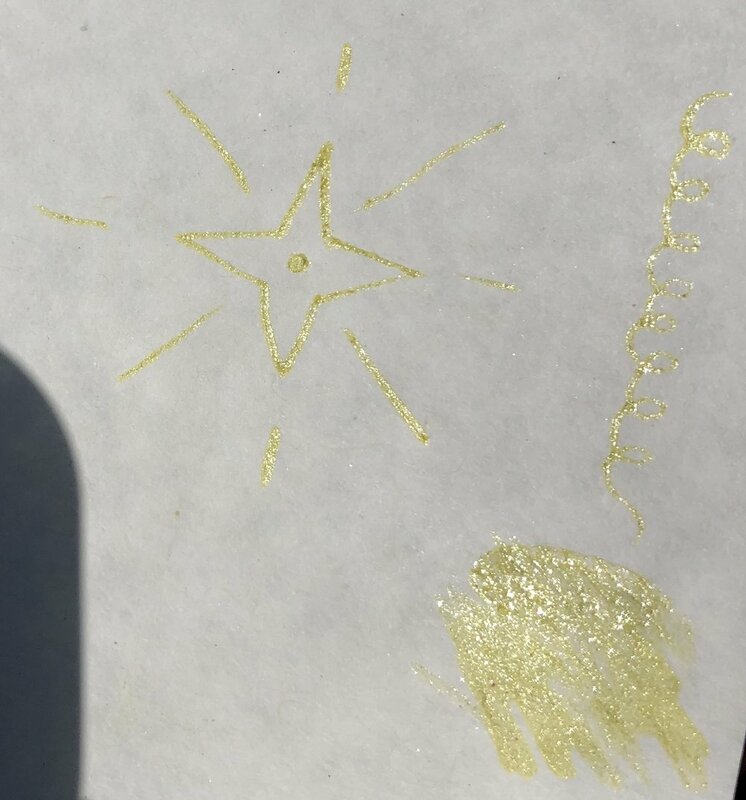 I found a DIY recipe online to make erasable chalk paint, and it allows us to create our own colors. 04:40 Crafty Scribe: I am hoping this recipe works and the chalk paint doesn’t permanently stain the blackboard. This is my first attempt using this recipe. If it works, it’ll be a lot more affordable than purchasing chalk markers (etc) and I can customize the colors I want to use (I searched several retail stores and wasn’t happy with the chalk marker color selection). 05:10 added gel hand sanitizer in little by little, stirring each addition until the consistency was similar to pancake syrup. I used a rubber spatula to scrape off chalk paint from sides of the mortar bowl before each additional mixture. 05:25 It’ll take some tweaking to get the consistency just right - adding in more chalk or sanitizer gel/water - but for now, brushing the chalk paint onto the board takes some getting used to, it is gloppy, but slow strokes and a generous amount of paint provide a bolder, more solid color. 05:33 I had to experiment with different brush sizes/types, and I even tried a bamboo fine tip pen, but this finer tip brush works best for what I need. After the paint dries, I’ll put on another coat. I was able to easily wipe off and erase the chalk paint from the board. 05:50 What’s nice about this recipe is that you can store the extra chalk paint if you have any left over. If it dries out, just add water, gel sanitizer and/or chalk to “reanimate” / refresh / reuse it. 05:53 Crafty Scribe: I still need to add another coat or try a different paint consistency to brush it on more evenly, but here are most of the first signs that will be examples the children at the craft table can use to design their pet rocks. 06:28 This is my old dog, Maya. She regularly supervises me during my projects. 09:58 Crafty Scribe: Kilnin’ It project today: crafting handmade pen and brush holders with dry pigments (from my curated color collection), walnut oil, and transparent clay. I’ll be breaking in my newly acquired handcrafted glass muller. For larger (recurring) paint mixing jobs, a muller comes in very handy. 10:08 Crafty Scribe: I was not only testing color fastness (Andean Blue on the left, a metallic blue powdered pigment on the right), but how the colors would mix with the clay. 10:32 This year, I’ll be using a smaller shaping tool for the brush holder. 17:20 I used the same amount of oil in the metallic yellow and red... but the red came out much more liquidy. I added more pigment & made another pen/brush rest. 19:19 Crafty Scribe: first attempt. Not bad. Now, all are in the kiln. “Indirectly Direct” - a poem about the color violet. 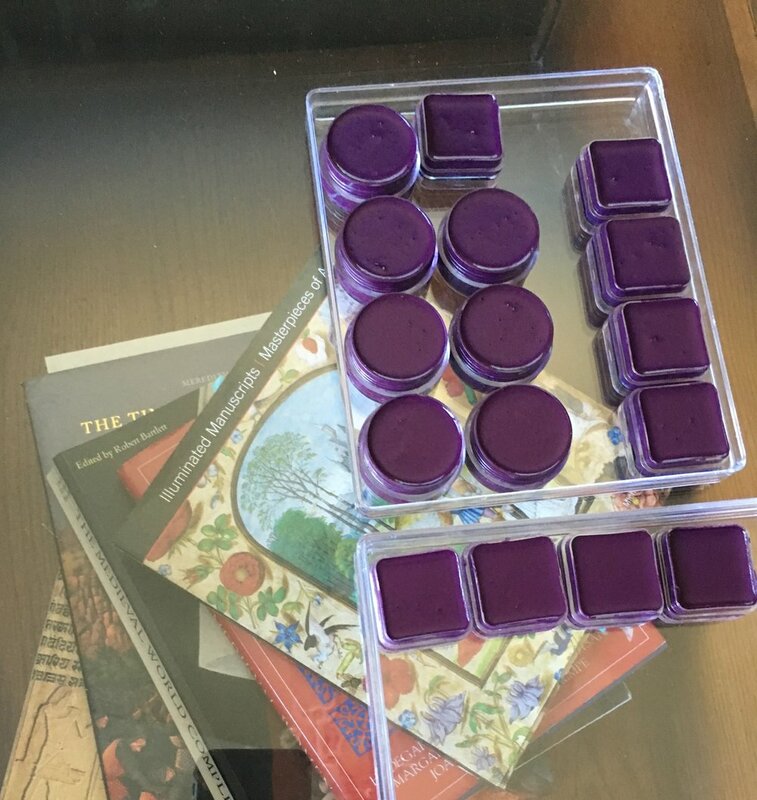 The backstory is that the second pigment I experimented with was a powdered violet pigment that had an ink-making / watercolor recipe I found online. I was having trouble with my blackened pine and burned birch ink recipes and was looking for other recipes. 08:01 Crafty Scribe: with ready mix inks & paints you have a lot of freedom with getting the color you want, the opaqueness or transparency and consistency (more paint like / thick or more watery) ... I found out early on that you may find a recipe, but whatever you may want to do with the ink/paint will alter the recipe - write down your own recipes and keep a record of them. Each pigment (and binder/medium, paper...) has its own character. They each have their own personality and you will get to know them like people. Be prepared to add a little more distilled water and/or binder and/or pigment. The metallic violet experiment was written on off-white parchment paper and with a glass tip pen. 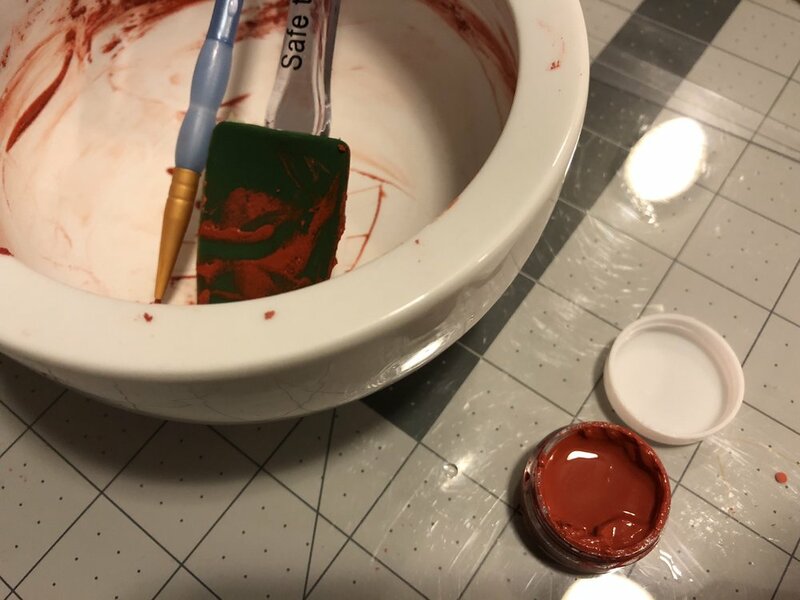 With this powdered pigment, a glass tip was ok to use, but with the mineral-based / earth based pigments I recommend metal nibs (or brush or bamboo/wood tipped pen, depending on your project). Glass tips tend to wear down (and eventually break) over time - rock/mineral versus glass? - rock wins. 08:12 Crafty Scribe: more about the color VIOLET (and my poem). Tyrian purple is one if not THE most expensive pigment in the world. The pigment is extracted from a snail. Poor little snails ... they dye very well... dark humor. 09:09 Crafty Scribe: after a little over a year, I have four contact sheets of recipes & a record of how they were used. 09:11 Crafty Scribe: I will start to share these recipes. However, remember: they are only a guideline. Your recipe may vary based on what you do with the ink/paint. 09:12 Crafty Scribe: Back to the poem “Indirectly Direct” (about the color violet/purple). I first played with the metallic violet on May 4th of last year. June 22nd I experimented with Violet (now in the medieval kit). In August & September I researched the history of the color violet/purple for a then unnamed poem (which was later titled “Indirectly Direct”) The metallic violet was a color shifter - you can see that at different angles it shines and reflects light in different ways - whether the light is directly hitting the ink on paper or it’s an indirect light. 09:16 Crafty Scribe: I was influenced at the time by the solar eclipse that happened August 21st, both by my experience of it and the photos that were posted online. One such image showed a violet ring around an eclipsed sun. 09:55 Crafty Scribe: this is the research (and verse drafts) I did before writing the complete poem. With just a few words a poet can pack in a lot of meaning - and how you word it may be taken in many directions (by the reader). 12:28 A new blue arrived today (template of one I plan to make myself) ... Welcome, WOAD. 12:29 Crafty Scribe: and then, there were eight. 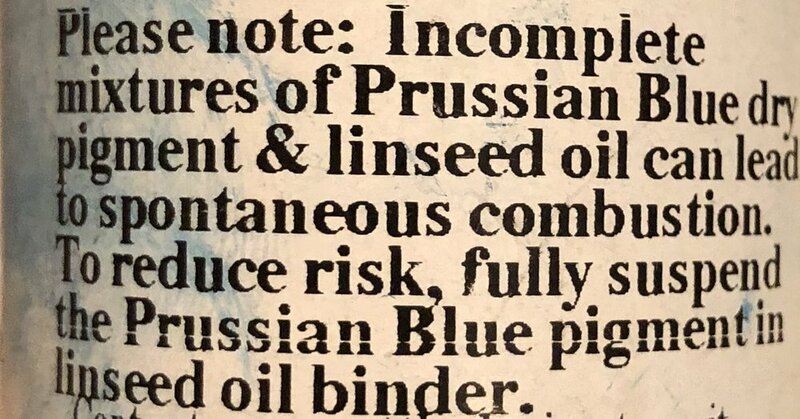 28 May (45) - The first Scribe's Ink pigment + "Sinisthereal"
10:19 Crafty Scribe: The first dry pigment I made was blackened pine using a recipe that's been around for thousands of years. I call it Blackened Pine. How I produce it is a labor-intensive process. I use this carbon black to make an archival black ink to write calligraphic copies of my poems, short stories and to create my authentic mark on my photographs. This is how Crafty Scribe started... well, after a life's worth of craftiness. The waypoints of my pigment journey are recorded in the form of poems. BLACK is represented in "Sinisthereal"
10:24 If you're interested, you can visit wanderingmind.space to explore more of my writing and its spin-offs there. 11:17 Crafty Scribe: Highlights of projects that led to Wax Poetic. 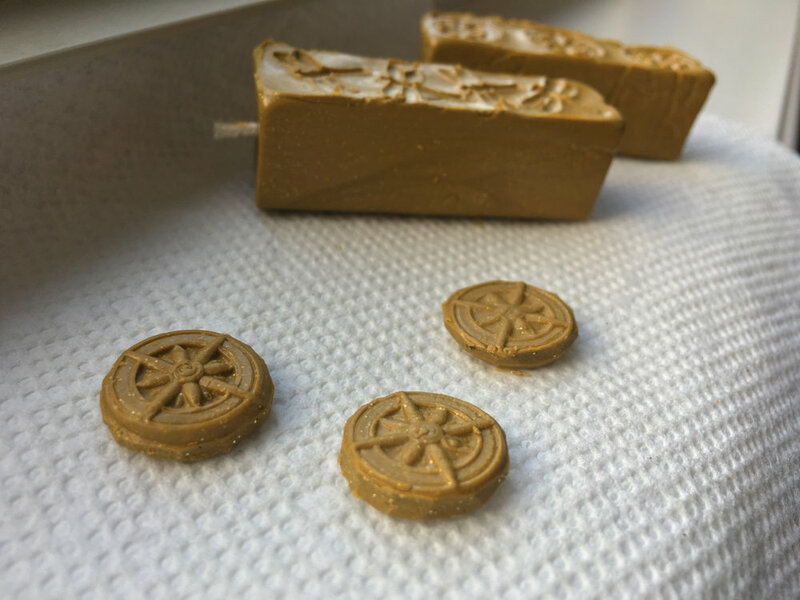 Header Image: a handcrafted wax stamp design. Image: Burned Birch dry pigment - a spin-off project of the poem "Burning Birch" and also the short story by the same name "Burning Birch"
08:08 Crafty Scribe: My craftiness started at a very young age, and I had many spaces in which to hone it. My paternal grandfather's workshop was in this barn. This is the place that inspired the Love At First short story "Hay". 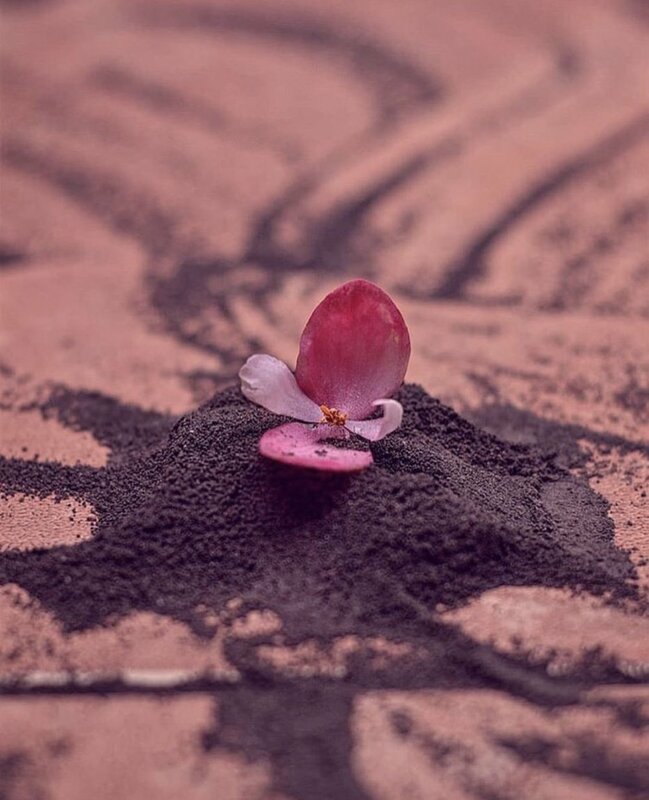 A portion of this photo appears as the header image to the short story. Scribe’s Ink, Wax Poetic, Carve A Niche, Fine Threads & Kilnin' It are all a part of Crafty Scribe’s handcrafted product line.